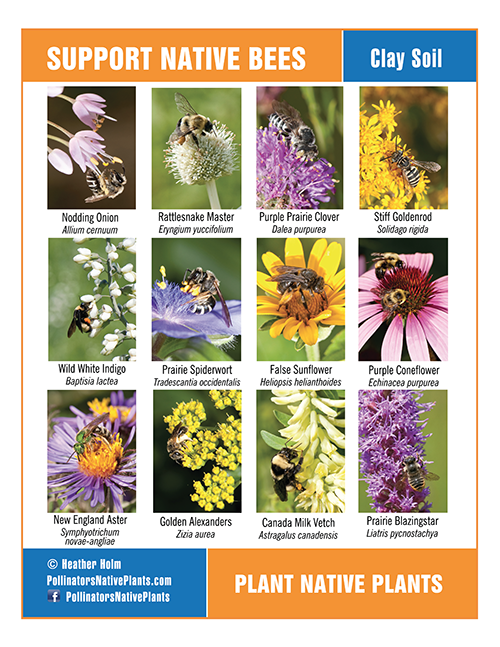 Restoring The Landscape With Native Plants: Native Bee Spotlight: Leafcutter Bees ~ Megachile spp. Native Bee Spotlight: Leafcutter Bees ~ Megachile spp. Leafcutter Bees are a medium sized, long-tongued native bee. 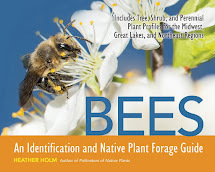 They have a flattened or deflated looking abdomen, and often visit flowers with their abdomen curved upwards. 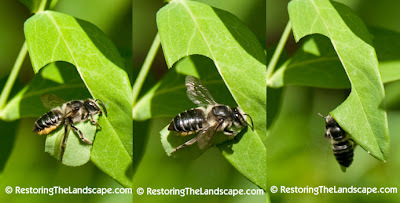 We start to see Leafcutter Bees in our landscape in early June. 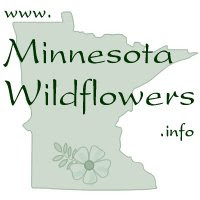 Some of the first native plants they visit are Harebell and Pale Purple Coneflowers. Instead of collecting pollen on combs on their legs, females collect pollen on the underside of their abdomen where they have long hairs. 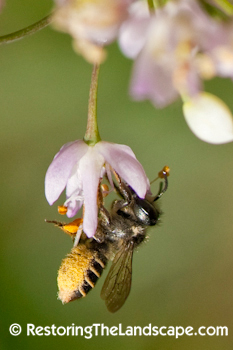 A female nectars on Nodding Onion (Allium cernuum) showing off her pollen-laden belly. 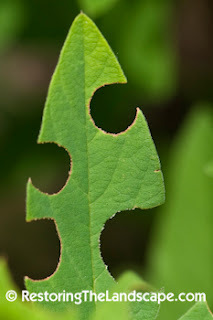 If you don't see Leafcutter Bees on your native plants, look for circular or oval shaped cuts in the foliage like this. 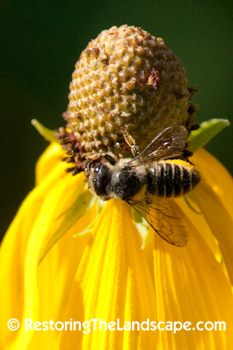 Females use their sharp mandibles to cut pieces of leaves from foliage. I captured this female cutting an oval-shaped piece of leaf from our Great St. John's Wort (Hypericum pyramidatum) this summer. Leafcutter Bees use these pieces of leaves to line their brood cells where they build nest in pre-existing cavities such as in wood or hollow stems. 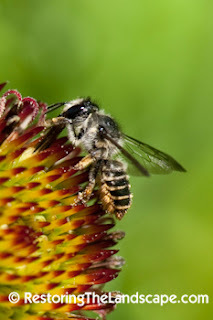 Look for Leafcutter Bee females collecting pollen and nectar from a wide variety of prairie plants such as this Gray Headed Coneflower (Ratibida pinnata). 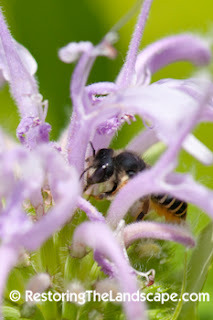 Also feeding on nectar on Wild Bergamot in July. This Leafcutter Bee is taking advantage of a short cut created by a wasp. 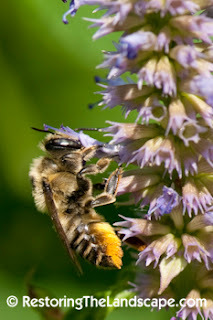 The wasp chewed a hole near the base of the tubular flower to get easy access to the nectar (nectar thievery). 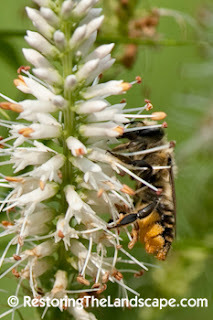 Leafcutter Bee on Fragrant Hyssop (Agastache foeniculum), a licorice (anise-scented) prairie native. In moister locations, Leafcutter Bees will visit Culver's Root (Veronicastrum virginicum). 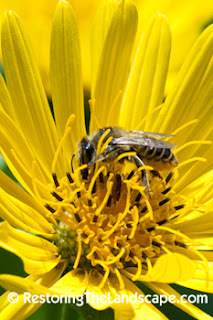 Also Cup Plant (Silphium perfoliatum) in late summer.